Mankind is looking for a new planet to call home. Work together to land people on a new world and save humanity! Last Starfleet challenges you to work together to establish a new home for humanity after Earth explodes. Using a specific ship and a matching deck, you play cards each turn in an attempt to land people on the surface of a new world. But each turn, the planet itself presents dangers and challenges that make this quest anything but easy. You can dock cards to your ship, upgrading its capabilities. You can dock cards to the atmosphere of the prospective planet to everyone’s benefit. Players must work together to transport 75 people from their ships to the planet surface – successfully colonizing the planet and winning the game. There are six different ships (factions) in the game – each with some unique characteristics – and you get to assume the role of one of them. From the slightly xenophobic scientists from the SS Discovery to the irreverent loners from the Gadget, each ship comes with its matching deck that infuses the game with unique attributes to support the colonization of the planet. Each ship has a starting number of People tokens on board and three spaces below to “dock” cards that will provide upgrades and benefits. 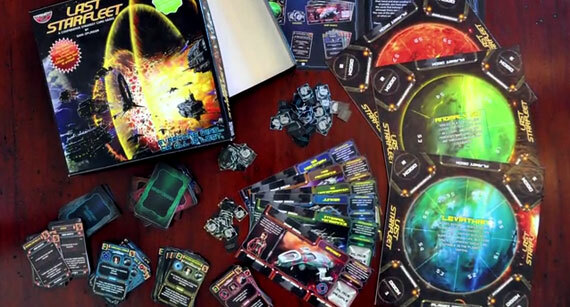 Last Starfleet is a card driven game, so knowing the different types of cards is paramount to success. There are three card types in the game: Ship Cards, Planet Cards and Orbit Cards. Ship Cards: As was mentioned, each ship comes with its own deck where you will find cards that mainly allow you to transport people to the surface below. However, some cards may be docked to your ship in the slots at the bottom of the ship mat. These will provide a benefit for as long as they are docked there. Planet Cards: There are three planets to choose from when beginning the game: Anomaly Six is a Planet veiled in a gas cloud, Leviathan is an immense water world teeming with indigenous life, and Red Giant is a molten world with violent seismic disturbances. The Planet cards that accompany each world are themed to each and provide specific dangers to your ship and people on them. Orbit Cards: These cards are subtitled “Perils of the Void” and represent the common dangers that space travelers will encounter when trying to survive in deep space. Ship cards will have one of two symbols in the upper left corner of the card showing when they can be played. A green triangle represents a card that can be played only on your turn and goes into effect when played. Cards with a red exclamation point may be played out of turn in reaction to some game effect or requirement. In addition, three symbols in the upper right of cards describe how Ship and Planet cards can be played. Cards with the symbol of the lightning bolt are played and immediately discarded. Cards with the symbol of a red space ship can be docked to your ship mat. And cards with a green arrow in a cloud can be docked to the atmosphere of the planet. Choose one of the three Planet boards to use and place the others aside. The Planet cards matching the chosen planet and the Orbit deck are shuffled together to form the Planet Deck. Place it next to the Planet board. You and your fellow players choose a ship, taking the appropriate Ship mat, matching Ship deck as well as a number of People tokens equal to that ship’s “Starting People” value listed on the Ship mat. Place the people (in whatever denominations of 1,5 and 10 you choose) on the “Place People” section of your ship. After a starting player is chosen the game begins. 1. Planet Activation: Players draw cards from the Planet deck and play them to the Planet board. The number of cards played varies based on the number of players. 2 cards for a 2-player game, 3 cards for a 3-4 player game, and 4 cards for a 5-6 payer game. Gameplay for this step then follows the effects of these cards. They may be indigenous life forms attacking colonists, or the planet itself causing threats to ships in orbit with electrical storms. Whatever it is, the combination of Planet cards and Orbit cards rarely turn out for the better. So hold on! 2. Atmosphere Activation: During this step, all the cards that are docked in the atmosphere of the planet take effect. These can be positive or negative depending upon whether or not you and your fellow players’ ships played them, or the planet itself is wreaking havoc on your plans for colonization. 3. Ship Activation: In player order, each player plays one card from their hand, and then draws one card from their Ship Deck. Once again, these cards may have immediate effects, after which they are discarded; or they may dock to you ship mat, giving you an added advantage, and may dock to the atmosphere of the planet, advancing your goal to colonize the planet. Obviously the game evolves depending upon the interaction between the cards as you try to avert disaster, keeping your ship safe and landing your citizens on the planet. You may be able to help your fellow, captains but the planet is relentless. Often times, key effects from the planet deck will damage your ship, killing people on your ship, or worse, killing off your citizens on the planet surface. There are five surface spaces on the planet “Anomaly Six” where people can land labeled S1 – S5 (other planets have different numbers). And many times the planet will do damage against these spaces. In this case, people are removed from the surface – making your goal that much more difficult. Sometimes, a detrimental card (Like the Planet card “Blackout”) will have a negative effect to gameplay, but will list a damage rating, or hit points. If enough damage is done to this card (By playing a card that says “X Damage to…”) then it can be discarded. However some cards don’t have any damage rating and must be “displaced,” that is, another card must be played to replace the card in that slot. These are tough! If your ship takes damage, people are discarded from your Ship mat. If the unthinkable happens and all your people are destroyed or landed from your ship, you have gone “Ghost Ship.” You have to collect all your Ship cards and you don’t get to play cards anymore. However there may be a way for other players to help bring you back into the game. You still win if all the other players succeed. If 75 people are landed safely on the surface, all players win. However, if all players go Ghost, the light that was humanity will be extinguished from the universe. Don’t lose hope, you can try again! Very low. Because this is a card effect driven game, you can jump right in and see how difficult it is to accomplish the victory condition. (Yipe!) Play the cards, read them and apply their effects. However, with several plays and a good knowledge of your Ship deck, as well as familiarity with the specific Planet deck’s effect, you have an edge over certain defeat. For families that hold game nights with older children, this game is accessible and provides a fun and non-violent, sci-fi themed co-op experience. The struggle to survive begins from the first turn, so the thematic experience is tense. Card interactions provide a good challenge for strategic and tactical thinking. Although the game seats six and is cooperative, it’s not a party game. However, the table talk can reach an amazing level of interactivity as everyone strives to achieve the goal. With the right group this could be a good social experience. Last Starfleet offers strategic players the ability to plan and work with other players to maximize the abilities of their specific Ship. Turns must be planned ahead of time to win the game. Even though the game’s volatility comes from random card draws, being only reactive will take the human race to the great beyond. A good strategic challenge with careful hand management required. Easy to jump into and learn the game as it reveals itself with each card flip. Minimum investment and great gameplay experience for the Casual player. Best with non-serious gamers who enjoy co-op and won’t want to take “command” of the rest of the players. Any gamer that enjoys unique card interactions, combo effects and the co-op experience of playing against a game’s A.I. will enjoy Last Starfleet. The only drawback that may turn off a fan of sci-fi games is that there are really no alien races and no direct conflicts. The game is not designed to be a space opera, so it may not be for everyone. Last Starfleet does offer sound mechanics, but a Power gamer will want more depth to the game: perhaps a tech tree or more detailed planet-side encounters and expanded ship abilities or an enemy alien race. The game stands on its own without these, but it may leave a Power gamer wanting more. The art and graphic design are the first things that make you want to crack open this box. Sci-fi games always hold the promise of exploration and innovation, and after opening the kickstarter preview copy, the giant planet graphics compel you to play. Set up is a breeze and the exploration doesn’t take place on the planet surface as much as in exploring the possible card combinations that will lead to you and your fellow players to mutual victory. Each Ship has its strengths and weaknesses, and gameplay forces everyone to work together against the Planet. Indeed one unique feature of this game is the fact that besides some nasty indigenous life forms that don’t really want their little corner of the universe invaded by settlers from another world, there is no alien interference to muck things up (a la Battlestar Galactica. I mean how easy would it have been to colonize a planet without those pesky Cylons showing up!). So the game operates very much on one semi-benevolent level, and the targets of many attacks are more obstacles than enemies. This is refreshing and makes the gameplay very accessible to families. It is mostly non-violent and has a positive goal at its end (colonization) instead of one based on annihilation of an enemy race (They need a place to live too right?). For Power or Strategic gamers this may not be enough. The game does feel like it needs an extra level for more advanced players (traitor mechanic? Interstellar battles? An enemy alien race vying for the same planet?). And who knows, this kickstarter is far from over, so variations in game play levels may be in the works. One thing is for sure, expansion planets and Ships are easily imagined and can extend the life of this game indefinitely. Like all co-op game experiences though, Last Starfleet is best played with a group of folks that you know you can rely on, that are affected by in-game tension and who don’t have a bossy know-it-all or alpha player that will “command” you and the other players. The best part of this game and any co-op game is that rising tension that leads to ultimate success or inevitable failure. Like a good new sci-fi novel, this game is a real page turner. You play and can’t wait to play again. With set up being quick and painless, that’s a good thing. I am not sure after five plays what the average win/loss ratio is, but suffice to say my play group and I are ready to try another planet. Which is to say it’s fairly difficult – but failure to win doesn’t cause indifference. The game has very tight card interaction mechanics and the decks are well-tuned. If you are looking for a light-to-medium weight space co-op, approachable for families, casual, avid and some strategy gamers, backing Last Starfleet and saving the human race is in the cards! NOTE: Do not republish this article. The game's funding failed and there is not yet any evidence of relaunch. In the year 4010, mankind has ships in space but no colonies beyond Earth. Earth explodes, leaving outbound ships - the last of their kind - to rally at the nearest life-sustaining planet. Pick your captains and team up in this cooperative strategy card game. You’ll work together to battle the elements and safely land your crew to save humanity! Everyone wins in Last Starfleet… or all is lost. In Last Starfleet, both players and the planet take turns. Cards either take effect and are discarded or they are placed, or docked, either onto one of the four atmosphere docks around the corners of the board or onto the player's mat in the ship docks. Players move people from their ships onto the the planet surface spaces in order to populate it. Atmosphere planet cards, those planet cards that are docked to the corners of the board, usually affect all players or all surface spaces while they are in play. People are placed on some atmosphere cards to represent hit points. Any card with Tokens placed on it can be damaged and forced out of play, or it can be forced out of play outright. Many actions are tied to the beginning number of players. When 75 people are placed on the surface, your team wins! 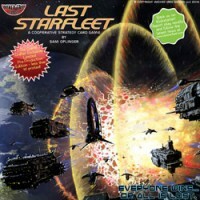 Add a Review for "Last Starfleet"